The garden receives attention at this time of year that it does not receive at any other time. It is not because of the blooms on the yuccas. And it is not because of the cactus or the bright yellow blooms of four nerve daisies. It is all because of the bluebonnets. The bluebonnets make the difference. Is there anyone in Texas that does not love bluebonnets? Passersby that never comment about my garden will comment about the bluebonnets. Cars creep by so the occupants can get a good look. Mothers sit their children on the curb in front of the bluebonnets to take their picture. I said this before and I believe it is true: having a familiar and beloved flower in my garden, like the bluebonnet, helps to bring about more acceptance of my lawnless landscape. I think the bluebonnets are the main reason I found this sign in my front garden last week. My garden was actually selected for the neighborhood Garden of the Month award! I never thought that would happen. I even nominated my garden last year at the peak of the fall bloom. There were more flowers blooming then, but no bluebonnets. I have a few bluebonnets blooming around my bottle bush in the back garden. I think I may start calling the bottle bush a bottle bluebonnet instead. In fact, I will label it a bottle bluebonnet for the upcoming tour. A couple of weeks ago I asked for help identifying a thistle-like plant that was growing in my garden. Ever since then, I started noticing them along roadsides everywhere. Thanks to Jackie, a neighbor on the Nextdoor website, I have a positive identification for the plant. This is musk thistle, Carduus nutans, an invasive weed from Eurasia that is now in almost every state. Musk thistle is a biennial and can grow up to six feet tall. This one was quickly growing and was already a couple of feet tall and wide. It quickly dwarfed the chocolate daisy on the right. You can read all of the dirty details about this foreign thug on the TEXASINVASIVES.org website. Once the plant was identified as an invasive species, its fate in my garden was settled. It had to go before it had a chance to flower and produce seeds. So I took my trusty shovel and removed the musk thistle from my decomposed granite pathway. It was quite heavy and prickly. After giving it a few chops with the shovel, I carefully placed it in a lawn refuse bag so it can be composted into a useful garden addition. Good bye and good riddance, musk thistle. I knew I had reason to be suspicious of you. It's springtime and that means it is time for garden tours and native plant sales. A lot of people don't know about these events so I try to share information about the local events each year. For anyone thinking about making changes to their home landscape, garden tours are a great way to get ideas to incorporate at home. You can also discover new plants that grow well in the area. My garden is on the Plano Garden Club Garden Tour this year. The tour will be on April 25 AND 26. The theme is "Gardens to Inspire and Delight". I cannot guarantee any inspiring landscape ideas here, but I do have a delightful assortment of native plants that are unfamiliar to people that only shop for plants at the large home improvement stores. This is the cover of tour book. 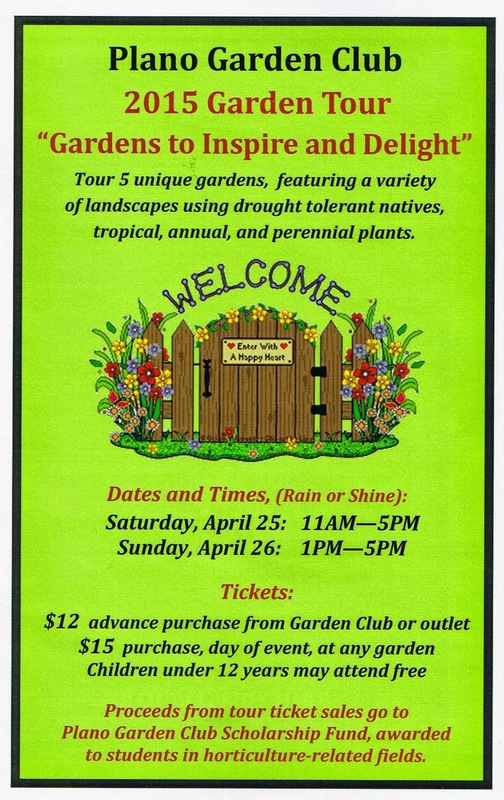 If you are interested in tickets, you can find more information on the Plano Garden Club website. Click the link for more details. Here is the page from the tour book describing my garden. One of the garden club members provided nice drawings of each garden for the tour book. The April edition of Plano Profile includes an article about the tour along with photos. The photos were taken on July 31 last year. I tried to get the photographer to come back in October when all of the fall flowers would be in bloom. He could not. Fortunately, last summer was not overly hot or dry and plants looked reasonably good at the end of July. The portion of the article about my garden is below. Click the link to read the full article. 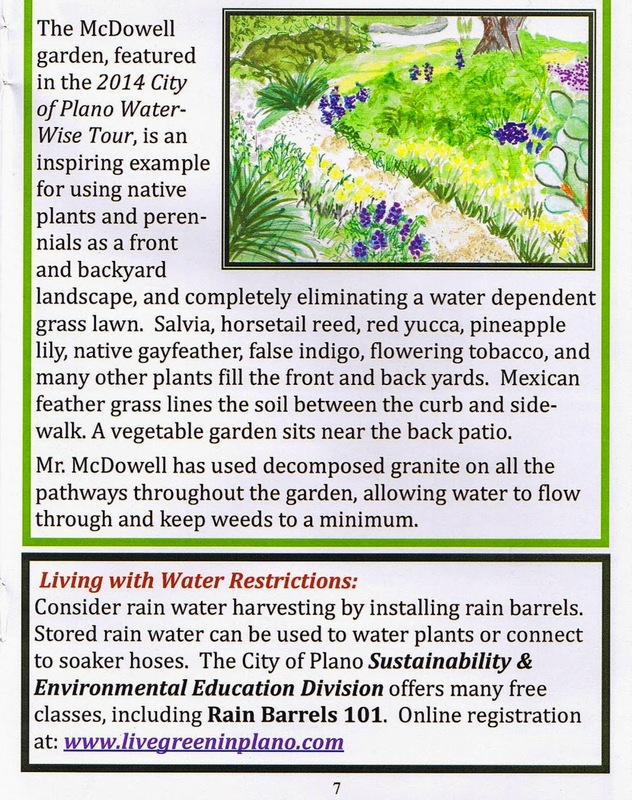 Plano has not announced landscapes for this year's water wise tour yet. This is a free tour and you can find more information here. Dallas Water Utilities will hold their Water Wise Landscape Tour on Saturday, June 6. There are always interesting gardens on this tour, especially in the White Rock Lake area. They are still calling for entries to this tour, so maps are not available yet. The tour is free. Keep checking the Save Dallas Water website for more information. In order to have an interesting native plant garden, you need to have native plants. You can find a few in nurseries, but my favorite place to shop for them is at the native plant sales held by various chapters of the Native Plant Society of Texas. You will often find unique plants that are not found anywhere else. Many of the plants available at the sales were grown in the member's own gardens so you know they will grow in our local soils and climate. A complete list of native plant sales in Texas can be found on the Native Plant Society of Texas website. Click the link for details. I summarized the local DFW sales below with links to more information and plant lists, when available. If there is a plant you really want, it helps to be at the sale when they open because certain plants will sell out fast. The only problem is it is hard to be first in line at all of the sales when they are held and that is what happened (again) this year. May 2 in Arlington. Not much info available yet. The North Central Texas Chapter sale will be at Redenta's Nursery instead of the Fort Worth Botanic Garden this year. Keep checking the Chapter's website for more Info. That should be enough activities here to fill up at least a couple of weekends this spring. In closing, here is a photo I took yesterday of a Hill Country Penstemon that I bought at a native plant sale last year. I will be looking for more of these. Texas' favorite wildflower is in full bloom. Yes, it's bluebonnet time in North Texas. This is the time of year when more passersby comment about my garden or, rather, the bluebonnets. Everyone loves bluebonnets. From this angle, it almost looks like my entire front yard is full of bluebonnets. If only that was the case. When I stand up, it is clear that there are very few bluebonnets growing in the main portion of the garden. They are growing primarily in the parkway between the street and sidewalk where there is less competition from other plants, no mulch, and better drainage. The parkway is packed with bluebonnets. So many that they are blocking the flagstone pathways that I created to get visitors from the street to the sidewalk. Another reason I added this flagstone was so neighborhood mothers would have a place to plop their children when they take pictures of them in the bluebonnets. In the past, I have seen mothers place their children on the curb or in thin spots in the bluebonnets so they could take pictures of their children. The flagstones will give the children a little more space to sit. Bluebonnets are not too picky about where they grow as long as they get a lot of sun and good drainage. For me, they grow best in the decomposed granite in the parkway. They will even grow in cracks in the sidewalk. They also grow in my decomposed granite pathways. But no matter how many seeds I throw in the main part of the garden, very few grow in the soil. Maybe next year.